In the 19th century, the Meissen manufactory began to produce a variety of historicist porcelain pieces. Decorative dishes, candleholders and boxes were designed in the style of bygone eras such as Baroque, Rococo and Gothic, and in some cases combined elements of these movements with one another. 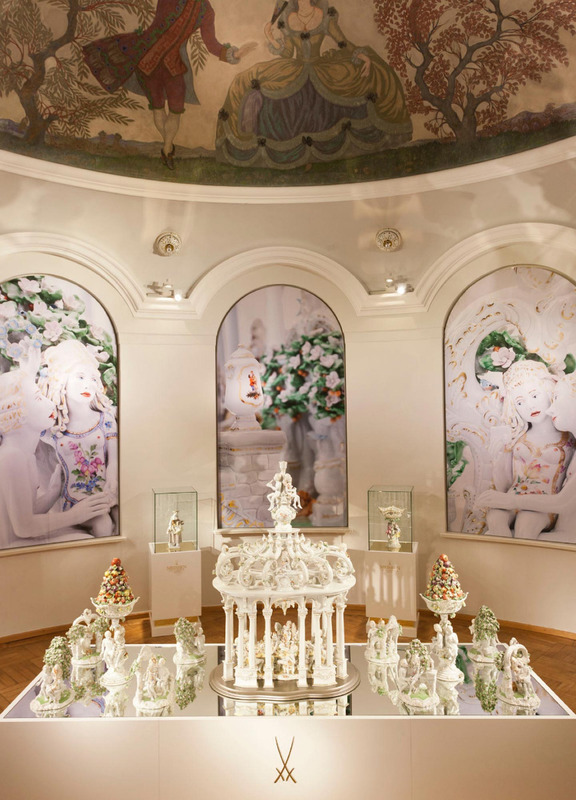 The opulent porcelain pieces, which were often completely covered in sumptuous, colourful patterns, corresponded to the desire among the affluent classes of the time to demonstrate their prestige, and also paved the way for Meissen’s success at the World’s Fairs in London, Paris and Chicago. For the “New Splendour” collection, these historic designs have been reissued and reinterpreted with modern finishes. 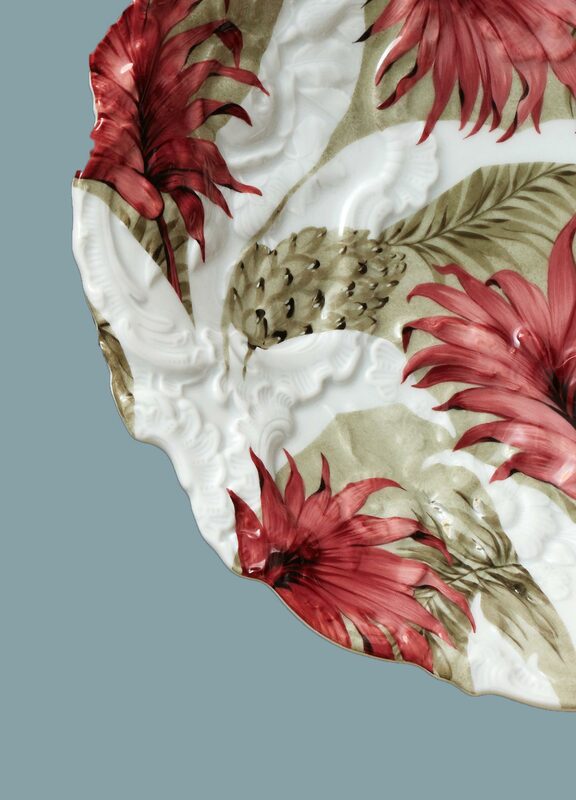 Leaf patterns and floral motifs are applied to the structured porcelain as a second coat without taking on the embossed patterns of the pieces themselves – a novelty in the manufactory’s design repertoire. Painting the full-cover design on a relief background as well as its application all the way to the edges presents a particular challenge to the manufactory’s painters. The collection comprises three decorative dishes, a candlestick and a box. "The patterns are painted on an elaborate historic relief background. We were fascinated by the idea of creating a second level that ignored the base of the piece and applying it almost like a separate layer. The floral motifs on the box and the decorative dishes are inspired by tropical floral prints from the 1940s. A unique, somewhat muted colour palette is characteristic of these prints – colourful, but not overly bright. In terms of the blue and white “Linear” pieces, it was the exact opposite. I approached the Baroque relief in a completely different way, leaning somewhat on Rocaille patterns, to really bring the structure to the forefront. The dynamic seashell patterns bring a unique kind of movement to the sleek monochrome pieces." 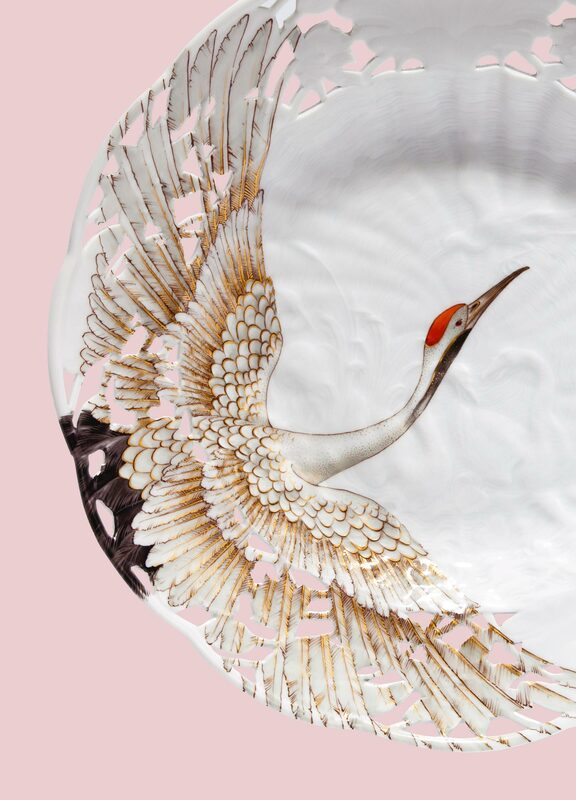 Ornamental dishes are some of the most impressive pieces ever created by the Meissen manufactory. Originally a decorative aspect for table settings, starting in the mid-19th century they became the benchmark for the quality of Meissen craftsmanship after being presented at the World’s Fairs. 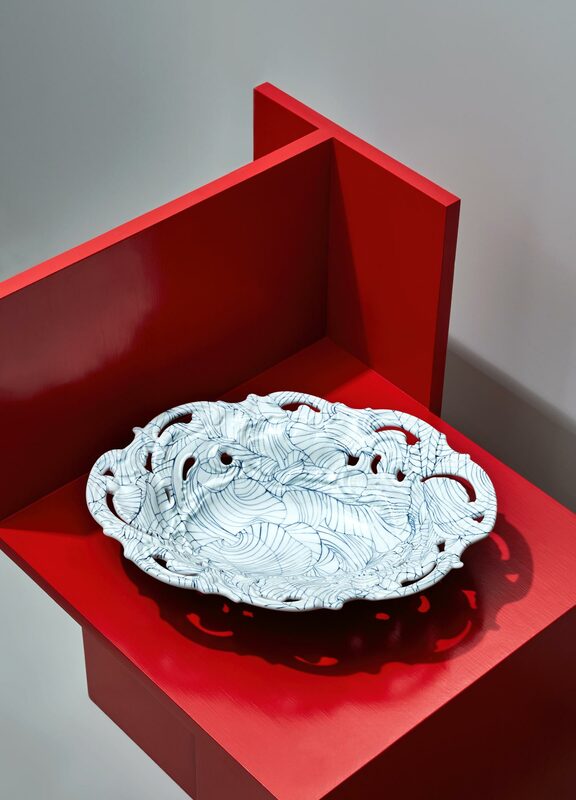 For “New Splendour Linear”, Otto Drögsler covered every centimetre of the Baroque contours of these historic dishes and candlesticks with a leaf pattern. The dynamic seashell patterns lend a unique kind of movement to the sleek monochrome pieces. The delicate, hand-painted lines trace the Rocaille contours of the porcelain in parts, bringing the relief designs to the forefront. 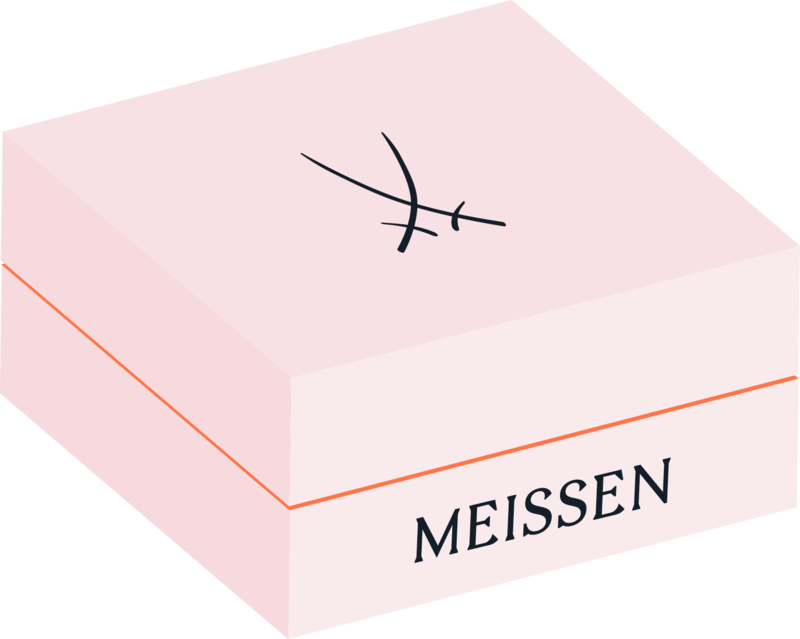 The painted designs that run in contrast to the reliefs have been applied to a Meissen decorative dish for the first time ever – an entirely new approach for the manufactory. Applied in one continuous layer, the finish emphasizes the pronounced relief structures that were masterfully created by Meissen’s skilled porcelain artists. 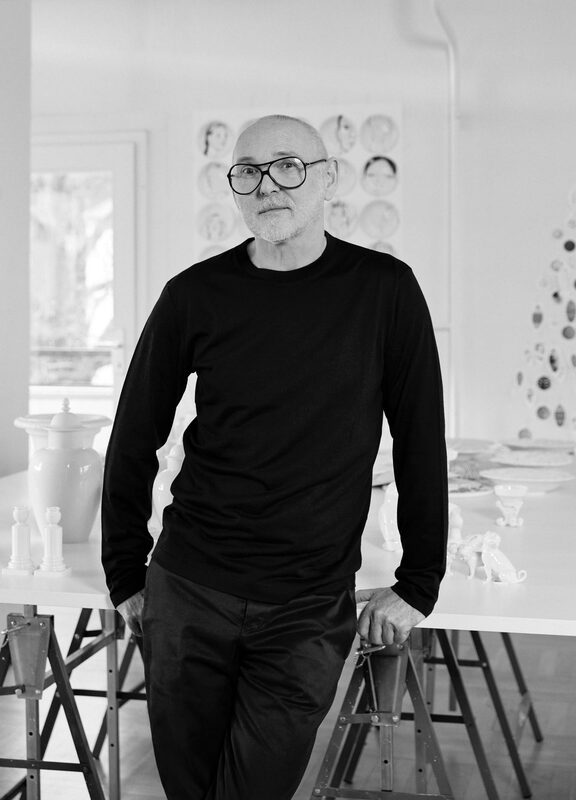 Otto Drögsler breaks with the Meissen tradition of using a naturalistic approach to decorating structural elements by applying a full-coverage modern pattern to this historic porcelain dish design. The floral motif is inspired by tropical floral prints from the 1940s and features a colourfully yet muted palette that was typical for that time. 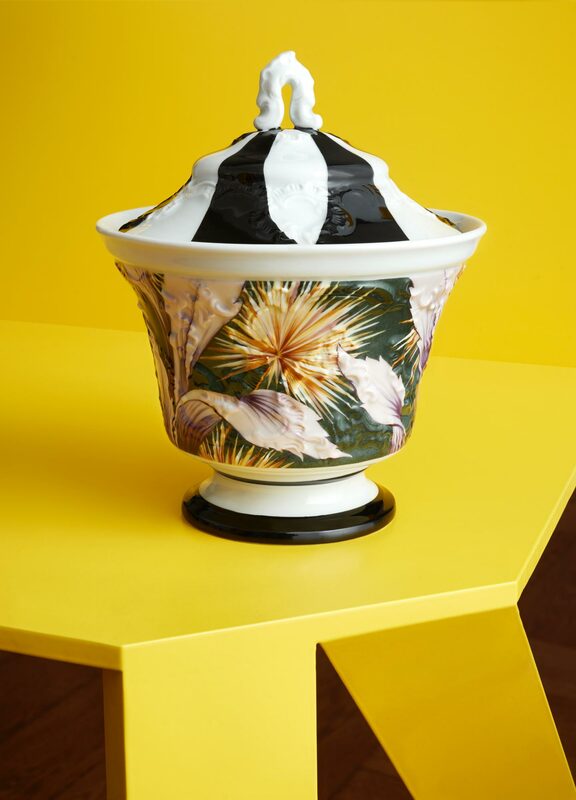 The exotic flowers are juxtaposed with the dishes’ black and white backgrounds, offering a striking visual contrast. The design is hand-painted on an elaborate relief pattern, reflecting the masterful craftsmanship of Meissen’s artists, and is applied in two on-glaze firings. After the background has been applied and fired in the first on-glaze firing, figurative elements are painted on the piece in 10 different colours, shading is added, and then the piece is fired once again in order to achieve its characteristic brilliance. These Gothic-style decorative dishes were first created in the 19th century. 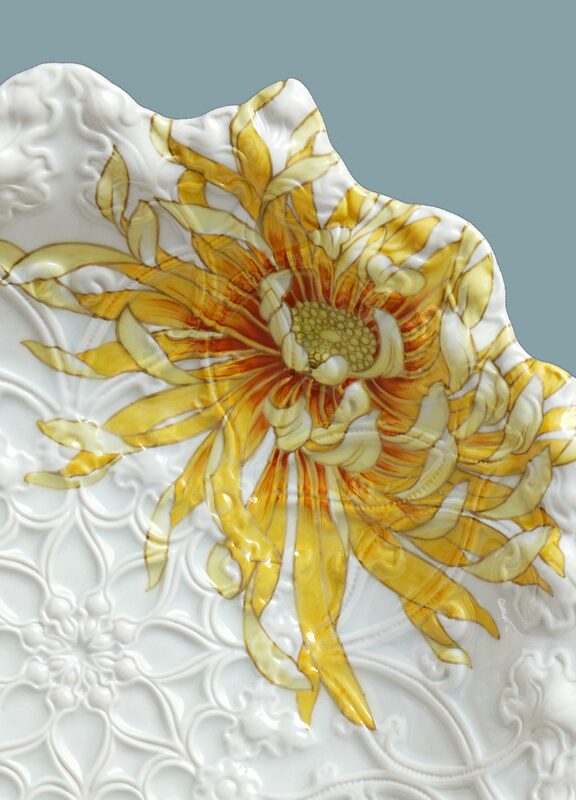 The elaborate relief design is the only one of its kind in the Meissen range. For the first time ever, this historic design is paired with modern decor in the “New Splendour” collection. For the dahlia pattern, which covers the entire dish, Meissen’s porcelain artists had to draw on their unparalleled expertise. First, the contours of the petals, gills and stamens were outlined with a paintbrush, and then coloured using nine rich colours. The collection is a symbolic representation of the manufactory’s craftsmanship and long-standing tradition: the marriage of modern decor and timeless historic design. The “New Splendour” collection is the first series in which MEISSEN applies hand-painted patterns to pronounced relief structures. The modern painting technique is wonderfully juxtaposed with the rich and extremely precise relief structuring on the historic decorative plate designs. The intricate on-glaze decoration is applied in two stages: First, the grey background is hand-stippled with a sponge. Once it dries, it is hand-painted with grey flowers and leaves. After the first on-glaze firing, the other nine colours in the pattern are painted by hand and, after multiple drying and shading steps, the piece is fired once again in order to achieve its final appearance and brilliance. The “New Splendour” collection’s floral motifs are inspired by tropical floral prints from the 1940s. They are applied by hand in a variety of colours. The muted colour palette and detailed shading are characteristic of these intricate designs.